Set against the backdrop of the Dutch invasion of Bali just over a century ago, and the resulting "mass suicides" of the Balinese royalty, the moving story unfolds of the peasant Pak and his family and friends, and the tragedy that is their shared fate. Written within living memory of the bloody events called the puputan (the "ending"), Love and Death in Bali is the story of a passionate yet peaceful and deeply spiritual people who defy the Dutch imperial forces through an act that would bring them certain death--and certain rebirth. The looting of a Chinese trading ship gives the Dutch colonial forces the perfect excuse to intervene in island affairs, but they encounter astonishing resistance. In the battle of Badung, wave upon wave of Balinese clothed in white ceremonial garb charged into the blazing Dutch guns, kris daggers in hand, prepared to die. Who among them will survive, and how will their lives be forever changed? 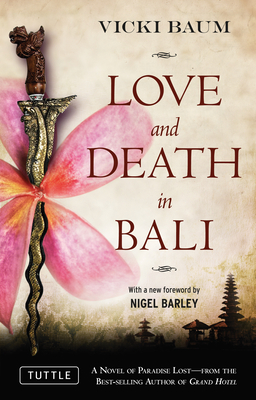 Love and Death in Bali, first published in German in 1937, is considered by many to be the finest novel ever written about this island paradise where everyone, regardless of caste or position, is woven into the fabric of an ancient culture, connected by customs and, above all, by strong religious beliefs. now reissued in a completely re-edited edition under its original title, with an introduction by anthropologist and award-winning author Nigel Barkley. Vicki Baum, best known as the author of Grand Hotel and The Weeping Wood fell in love with Bali on her first visit to the island in 1935. There she met German painter and musician Walter Spies, a longtime Bali resident with an unrivaled knowledge of Balinese life. He bequeathed her the raw material for fashioning this compelling tale. Nigel Barley trained as an anthropologist and linguist and served some twenty years as an Assistant Keeper of the British Museum, where he was the curator of African and Indonesian collections. his most recent book, Island of Demons (Monsoon: Singapore), is a novelistic treatment of the artist Walter Spies and his milieu.